You are currently browsing the category archive for the ‘Lows’ category. Last Friday, I took part in my first Facebook Live chat as part of The Lowdown campaign. (If you’ve not watched the Facebook live chat, you still can by clicking here.) I was joined by former AFL footballer, Jack Fitzpatrick, who has lived with type 1 diabetes for about six years. Jack and I could not be more different. He speaks a language of sport of which I know barely one or two words. His perspective of the first few years of his life with diabetes are very, very different to mine. He talks about how, thanks to his workplace – and AFL football club – he had a doctor and dietitian working with him every day. He worked out how to fit diabetes into his job with the help of HCPs that most of us see a few times a year at the most. But there are also similarities. We were both diagnosed as young adults and we had to learn how to manage a very demanding health condition at a time when there is far more fun to be had. On Friday, we spoke about hypos, and his stories made complete and utter sense to me. The Lowdown campaign is a beautiful story telling initiative. That’s what has happened over the last week – PWD told their stories about hypos and time and time and time again, there were comments from other PWD who recognised that story. We recognised the way our heart might beat faster, or the confusion that heralds plummeting glucose levels. We nodded as we heard about people over-treating, because in the moment, that is all we feel we can, and must, do. We smiled at the silly things we read others do when low, (hello, HypoBoy). Every time I saw a comment from someone who said a version of ‘That happens to me too!’ I felt tingles. That connection comes only when we feel that we are not alone, that someone understands what we are going through. I get it – it’s why I read diabetes blogs and listen to diabetes podcasts. I’m looking for real life, authentic stories, the lived experience. As I said in the Facebook live chat, this campaign is a form of peer support. Because that is exactly what is happening – people with diabetes supporting each other, using stories that resonate, make us feel like we part of a tribe, helping us understand that our way of dealing with something is just as legitimate as anyone else’s. We all do it – we all seek out those that stories mirror our own. That doesn’t mean that we have to think the same way or do the same things or feel the same way. It’s not about there being a one size experience or everyone having the same thoughts and ideas. In fact, the diversity in what we see and read is important because it means that we can find the ones that we connect with most and help us better make sense of our own experience. Too often, the story of diabetes is told using statistics. That is the way researchers and healthcare professionals and governments talk. But for those of us actually living with diabetes, it will never be about the one in how-ever-many-thousand. We don’t want to hear how the dice is likely to roll or how the numbers keep getting more and more stacked against us the longer we live with this condition. We don’t connect with data, statistics or numbers. We connect with people and to their stories. That’s what we need to tell. And that’s what we need to hear. Yesterday, Diabetes Australia launched a new campaign called The Lowdown (please read my disclosure statement at the end of this post). It’s all about hypoglycaemia, and designed to get hypos out in the open by encouraging people with diabetes to share the realities of what hypos mean, look and feel like. There is stigma associated with hypos. Have you ever had a low and been asked ‘What did you do for that to happen?’. Or has someone ever asked you why you are not better prepared if you find yourself without enough (or any) hypo food on you? Has someone overreacted when you have been low, making you feel that you need to manage them at the same time as dealing with your hypo? Or has someone told you that you shouldn’t be having (as many or any) hypos? All these things have happened to me and the result was that often I simply wouldn’t say when I was low, or I would downplay the situation. Reading stats such as ‘people with diabetes have on average <insert arbitrary number> of lows a week’ always made me feel like an overachiever, because I could guarantee that I was having more lows than whatever stat was quoted. One thing I could rely on was that my friends with diabetes never made me feel like lows were my fault, or that I was hopeless because I didn’t have enough stuff with me. More likely, they would silently pass me a few jelly beans or fruit pastilles and leave me to deal with things myself, which is exactly what I need to do when low. This campaign is for PWD by PWD and that is why I love it. I’m hoping it will help us understand that others are dealing with the same crap around lows that we are. And that it is nothing to be ashamed of. Getting things out in the open is always a good way to reduce stigma and make people feel comfortable talking and seeking the help they may need. So, let’s talk about lows. Share your story and read what others have to say – remembering that, as always, we are not a homogenous group and you are likely to read a variety of different stories. That’s great! Hypos affect people in different ways. For some they are significant and can be terribly scary, and for others they are simply an inconvenience that just needs to be dealt with and then they can move on. No one’s experience is any less or more legitimate than another’s. Share a video or photo about how hypos make you feel. Share your post on your social media account (Facebook, Twitter, Instagram etc.) using the hashtag #TheLowdown2019. Please make sure you use the hashtag so we can find your contribution and share it and add it to our website. This page of The Lowdown website explains more. I work for Diabetes Australia and have had some input into the development of this campaign. I am writing about it because I hope that it will get more people engaged and interested in what the campaign has to say, and encourage contributions. I have not been asked by anyone at Diabetes Australia to write about The Lowdown here or on any other social media platform (but I’m sure they’re pleased I have). Transparency is always important to me and I declare everything relevant (and not relevant!) on Diabetogenic. You need to understand and consider my bias when I am writing and sharing. You can always contact me if you have any questions about this. So, something happened to me in Berlin that hasn’t happened for a while. I had a hypo. Actually, I had more than one. In one of those perfect storm situations where everything that could go wrong did, I found myself with a red Loop, no CGM, and in a pissed off mood. My Dex sensor had died in the morning and I couldn’t restart it because my transmitter died at the same time. I knew this was coming – I’d had the warnings. And I had a plan. I would use the reset app and get the transmitter going again. Except it didn’t reset. I checked and double checked that I was doing all that I needed to do, but the bloody thing wouldn’t work. I still wasn’t too stressed – I had a back up transmitter with me, plus I was at a tech conference surrounded by DIY tech nerds (I say this with great fondness). I put it all out of my mind, and focused on DOCDAY, launching our #SpareAFrown stunt and then getting on with the rest of the day. Three hypos later (thanks conference hypo syndrome, running around Berlin like a headless chook and more activity than normal), I was exhausted at the end of the day. But, as I gorged myself on fruit pastilles I realised a few things. I realised that fruit pastilles really aren’t all the tasty and actually a little gag-y when needing to get them down quickly. And I realised that the return of hypos made me very annoyed. ‘Three hypos today,’ I announced. ‘This is lousy.’ I complained to anyone who would listen, and probably stamped my foot a little too. But there is a silver lining. Kind of. As I whinged and moaned about my day of lows, a friend asked if I had symptoms for my hypos. I stopped and thought about it for a moment. ‘Yes…I felt them all,’ I said. ‘You’ve got your hypo symptoms back,’ he said. I hadn’t thought about that, but it was true. I had felt the undeniable heightened anxiety that indicated that I was low for each of the three hypos I’d had that day. My heart rate had increased a little – not too much, but enough for me to notice. And that feeling was confirmed with a finger prick check. These hypos were relatively easy to manage – a few of the bleurgh fruit pastilles and all was good. If I had to explain them in one word it would be ‘annoying’. But I did feel exhausted and drained. I was more than just jet lag and conference-tired; I was jet lag, conference and hypo-tired. By the end of the day, I had my back-up transmitter paired and the two hour warm-up passed. I calibrated and my Loop turned green, and said a little prayer of gratitude to the Loop gods. The hypos stopped, and the next day I went back to ticking along as I have become accustomed after eighteen months of Looping. And that’s where I’ve been since then. Absolutely one of the best things about Loop is the way that it helps me manage lows. I’m not for a moment saying that the system is so perfect that there is no risk of lows. Of course there is. But these days, I get enough warning and the system does its bit so that a mouthful of juice or a couple of jelly beans is all I need to manage any incoming lows. That day was the most I’ve thought about my own hypos in a long time. Of course, I think about hypos in general a lot. Being on the PAC for HypoResolve means that I talk and think about it a lot. And other initiatives, or talking with friends with diabetes means that it’s never a topic of conversation all that far from mind. There is a new website being launched by Diabetes Australia about hypoglycaemia. The idea behind it all is to reduce the stigma associated with hypos and also to encourage people with diabetes to share their own experiences of living with lows. Diabetes can be such an isolating condition – we know that. Hypos are part of the deal for so many of us. And yet, many of us are afraid to talk about it too much for fear we’ll be told that we’re not managing our condition properly. This new project hopes to bring the conversation out into the open a little more and you can get involved. If you are an adult with type 1 diabetes or type 2 diabetes on insulin, share what hypoglycaemia means to you, or even just share the word you would use to describe hypos. Email a photo and your words to thelowdown@diabetesaustralia.com.auand you could feature on the new website. Or, share a photo holding the word you would use to describe hypos using the hashtag #TheLowdown2019. When I was diagnosed with diabetes, I was told about hypos. I was told about a whole heap of things, and hypos was just one of them. To be honest, I can’t really remember the exact way hypoglycaemia was described to me, other than it being a very matter of fact part of my overall introduction to type 1 diabetes. There was other stuff that terrified me. If I close my eyes, I can still picture the images I was shown about diabetes-related complications. That discussion has had a long-lasting effect and I am still haunted by those photos. But hypoglycaemia was explained as something that is likely to happen, that must be treated immediately and that there were certain things that increase the chance of it happening. So with that introduction to it all, when did I start to fear hypos? It certainly wasn’t after the first one. In fact, that was a just a little episode of curiosity. ‘Ah…so this is what that hypo thing is all about,’ I thought as I live commentated it for my poor mother. For at least the first ten of living with diabetes, I had all my hypo symptoms. I’d woken at night time when I was low, treated and went back to sleep. Sure there were some lows that seemed to take longer to manage and to get over, but I always did so without any real issues. I worked out that there were different types of hypos with different personalities. When I was pregnant with our daughter I passed out from a hypo, and another time had a seizure in my sleep. But there was a direct line I could draw from pregnancy to low glucose level, so I just moved on. So when did I get to the point of fear? I don’t have any answers for this, and I can only speak of my own diagnosis experience. Hypoglycaemia was not presented to me as something that should terrify me. Night time lows were also never presented as something scary. There were times I was advised to check overnight, but there were always reasons for that: when I started pumping, I was asked to do a 2am check for the first week. When I was pregnant I was told that if I woke up to go to the loo, it may be a good idea to check and bolus if I was high (not because there was concern about being low). When I have been playing around with basal checking, I might set an alarm to check overnight. Where did the fear come from? I have no idea. There are so many ‘What if…?’questions woven into the tapestry of diabetes. With hypos, especially after a nasty one, I would spend a lot of time asking those questions. I have read posts I wrote after one of those lows and the terror is palpable, even though it’s been so long since I last actually had one. But despite the current absence of those difficult hypos, there is still a part of me that feels terrified. Anxiety and fear about hypoglycaemia is obviously not only an issue for the person likely to experience the lows. (I wrote here about fear of lows from people with diabetes and how that can impact on us.) Perhaps that goes some of the way to fuel the fear, but it doesn’t explain where their fear comes from. There are other aspects of diabetes that I don’t fear. I don’t fear highs even though I know they can be dangerous. I’ve had DKA and it was honestly one of the most awful experiences I’ve had. Yet I don’t fear it. Somewhere, somehow, at some point I leant to fear lows. I moved from hypoglycaemia being an inconvenience to being something to fear. I don’t know when or how. But it happened. Full disclosure: here I am eating Nutella to celebrate World Nutella Day earlier this week. Not because I was low. I have just returned from two days of meetings for the HypoRESOLVE project for which I am a member of the Patient Advisory Committee (PAC). Read more about this project here (and watch the short video at the end of today’s post). This is a huge project. Sometimes its scope hurts my little brain, but at the same time I love some of the almost audacious objectives and goals that have been set. I left the two days of meetings with a similar feeling that I’ve felt after the previous meetings. And that is just how little we know and understand about hypoglycaemia. This is one of the challenges when trying to define exactly what hypo is. Putting rings around something that is so personal, so diverse, so complex and so difficult to define for different people with diabetes is almost impossible. Our current classifications seem clunky at best; dismissive at worst. I am one person with diabetes, but my own experiences of lows is inconsistent. I used to have lows that lasted for hours and hours and hours. But that doesn’t necessarily mean that they were the times I clocked the lowest reading on my CGM or BG meter. Those numbers could have just been sitting at or around the low threes for those couple of hours, not trending up – no matter how much glucose I inhaled – but, thankfully, not trending downwards either. And then there are the lows that would send me into full overdrive of shaking and sweating and a pounding heartrate, but there may not have been consistency with the number. I could have felt like that at 3.3mmol/l or when my meter was not registering a number other than LOW. I understand that classifications use numbers because when glucose hits certain levels, we can measure things such as cognitive impact or physiological responses. But numbers when it comes to hypoglycaemia – and all aspects of diabetes – are only a small part of the picture. Sometimes I feel that the more I learn about diabetes, the less I know. And I have also come to learn that the allocation of numbers is sometimes almost arbitrary. They may make sense to researchers or regulators. But the reality is very, very different. The problem with this is that there is no way ever that diabetes is going to be able to be classified by fixed numbers. There needs to be wriggle room and agility in interpretation. I love that HypoResolve is trying to come up with innovative ways to satisfy all groups. Regulators need clear definitions to use as guides when considering new and different therapies. Clinicians and researchers need thresholds to point to. And people with diabetes? Well, we need to understand those definitions and the apply them to our own particular brand of diabetes…and how it may shift and change over time. And that’s where the PAC comes in. Our role is to make sure the real life perspective is front of mind all the time, and to remind everyone else on the project that there is nothing static or simple about living with hypoglycaemia. After a wonderful couple of weeks of real holidays – sun in Italy, less sun in London – I headed to Berlin, saying good bye to my family as we headed in different directions. I was bound for meetings before EASD officially kicked off. And they were headed to Wales and canal boats with extended family. We could not have found ourselves in more different settings! My first day in Berlin was dedicated to HypoRESOLVE, the Innovative Medicines Initiative (IMI) funded project looking to provide a better understanding of hypoglycaemia. I am on the Patient Advisory Committee (PAC) for this project, which kicked off back in May this year in Copenhagen. The project is divided into eight work packages (WP) and it was WP 8 that convened the first meeting. I was there as part of the PAC, and also to provide the personal perspective on hypoglycaemia. Back in May at the kick off meeting, I had given a talk called ‘The literal lows of my diabetes’, where I spoke about my own experiences of 20 years of diabetes and how hypoglycaemia had impacted on my everyday life. This was a very personal talk, where I spoke about the fear and anxieties of lows, my different hypo personalities and the terror that comes with impaired hypo awareness. But for this new talk, I wanted to do something different. I didn’t want to highlight my own experiences, because I am but one person and it is important that the audience never feel that they have ‘done diabetes’ and understand the ‘patient view’ because they have listened to one person. I wanted my focus to be on the disconnect between how hypoglycaemia is regarded in the clinical and research world as compared with the real-living-with-diabetes world. It was apparent straight away, as the responses came flooding in, that the way hypos are described and classified in clinical and research terms is very, very different to the way those of actually experiencing lows see them. Straight forward, neat, tidy, pigeon-holed. Some of the words were repeated multiple times, others appeared only once. 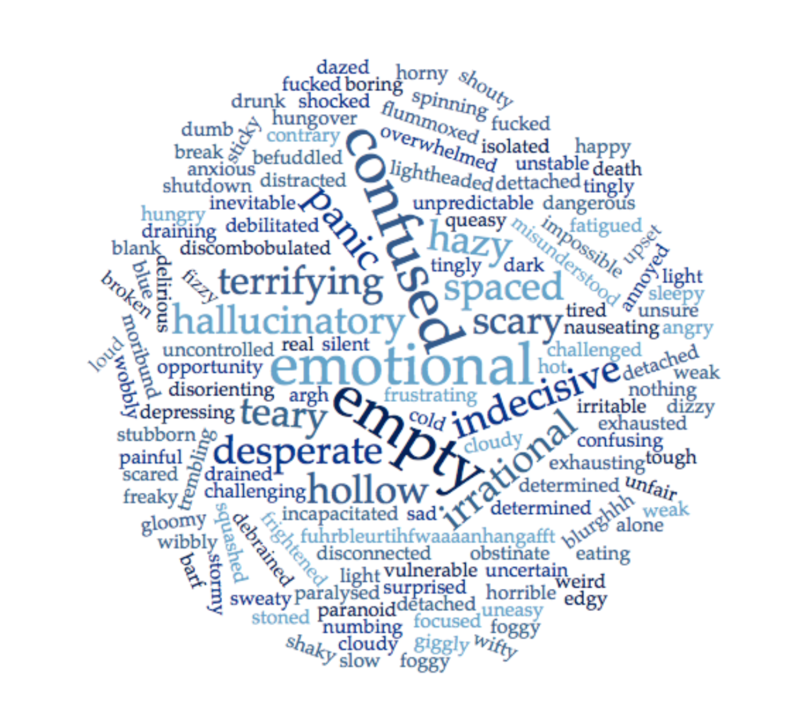 Some of the words are the words I use to describe my own hypos, many I had not considered. Yet every single word made sense to me. Hypoglycaemia, in the same way as diabetes, is not neat and tidy and it cannot be pigeon holed. I hope that my talk was able to illustrate that point. And I hope I was able to highlight that using simple words and simple categorisations only service to limit and minimise just how significant and impactful hypoglycaemia truly is for those of us affected by diabetes. You can keep an eye on the progress of HypoRESOLVE on Twitter, and via the website. The HypoRESOLVE project funded my travel from London to Berlin and provided me with one night’s accommodation. I am not receiving any payment for my involvement in the Patient Advisory Committee. Previous disclosures about my attendance at EASD 2018, can be found on this post. Look who’s taken over Diabetogenic again! Grumps is back to share some wisdom about how he deals with hypos. We know that when it comes to diabetes, there is the advice we’re given by HCPs. And then there is real life. I wrote about my ’reality versus what I was told’ when it comes to lows a few years ago, and today, Grumps is sharing his wisdom in the latest instalment of #WWGD. About ninety mins after lunch today my BG started to drop. It was a nice slow decline so having checked my insulin on board I decided to do bugger all about it and see what happened. It kept on its slow decent until at about 6.0 mmol/l the carbs on board stalled and it decided to do an impression of a flying hippo and dropped like a stone. What’s the advice for treating hypos?…. Falling asleep on the toilet and waking myself snoring…. I land at 8.6mmol/l just in time for dinner! Want more from The Grumpy Pumper? Of course you do! Check out his blog here. And follow him on Twitter here. A work friend and colleague was telling me about how she had been struck down with gastro a couple of weeks ago – a lovely gift from her kinder-aged daughter. Just the mention of the nausea and vomiting was enough to have me sweating and getting nervous. For the record – and so you understand my irrational fear of the topic – we weren’t sitting next to each other in an office while she was telling me. She was on the other end of the phone. Two states away in Queensland. I was in Melbourne. And yet I was still looking around me wondering what I should disinfect. A couple of weeks ago, on a Tuesday night I went to bed with my plans for the next couple of days clearly organised and sorted in my head. I had a most-civilised mid-morning flight the next day, and then a couple of days of meetings in Adelaide. I’d booked a cab, checked in online for my flight, half-packed my overnight case and mentally gone through the check list of what needed doing in the morning before I needed to head to the airport. And then, a couple of hours later I woke up startled, with a very unsettled feeling in my stomach. ‘That doesn’t feel good,’ I said to myself. I lay there for about thirty seconds trying to convince myself that it was all in my head and I was fine and that it would be best to close my eyes and go back to sleep. Before I jumped up and ran to the bathroom, making it there just in time before vomiting. For the first time. I spent the next few hours alternating between throwing up and being flaked out on the sofa willing myself to not throw up. I was cold and sweaty and hot and clammy all at the same time. My heart rate was racing, and every time I stood up I was dizzy. I gripped onto the walls as I stumbled down the corridor to the bathroom, tripping over nothing but my own two feet. At about 6am, I sent an email out saying I wouldn’t be getting to Adelaide and cancelled my flight. I crawled back into bed, still nauseous, thinking the worst was behind me. For the most part, it was. I threw up a couple more times before my official alarm went off at 7am. ‘I feel like death,’ I told Aaron. ‘And I bet I wind up in A&E.’ I used some choice words, mostly words beginning with ‘f’ and ending in ‘uck’, and started to work out how much time I’d lose in an emergency bed having to deal with HCPs wanting to remove my devices from me and ‘look after’ me. ‘Should I stay home?’ asked Aaron. ‘I can take you in that way.’ I told him it wasn’t necessary and that if I really needed to get to hospital my dad could take me. He got ready for work and the kid got ready for school and the two of them left, leaving me in bed, switching between dozing, holding my tender stomach and glaring at my iPhone and my Dex trace. I was hoping if I stared daggers at the trace hard enough it would stay in range. My Loop was working overtime. I spent most of the morning between 3.5 and 4mmol/l thanks to my Loop cutting off all basal insulin. By about 11am, I could see my CGM trace starting to inch up closer to 5 and then 6, and Loop was making tiny micro adjustments to my basal rates. I was able to keep water and some dry ginger down, and chewed on small blocks of ice. I didn’t feel dehydrated; I wasn’t going high. I didn’t have ketones. Things were looking good! By 1pm, I was feeling comfortable enough to call into the meeting I should have been at in Adelaide. My nausea was less pronounced. I felt washed out, achy and tired, but I hoped I was out of woods, and needing to go to A&E was becoming less and less likely. Thankfully. I have generally been pretty lousy at managing gastro and diabetes. I usually do end up in A&E, needing to be rehydrated and given some anti-nausea meds though an IV as I’m unable to keep them down after taking them orally. But of course, it ends up being far more of an ordeal than simply lying on a bed with fluids being pumped into me. There is the inevitable request for my insulin pump to be removed so that insulin can be administered via IV – even if it’s clear my pump is working just fine. Nurses insist on checking my glucose levels, refusing to pay any attention to the CGM spitting out readings every five minutes. My requests (demands?) to self-manage my own glucose levels – and diabetes generally – are ignored. I’ve no idea what would happen if I tried to explain the DIY APS thing I have going on these days, but suspect that wouldn’t go too well. Usually, it takes me making an emergency call to my endo for things to go the way I really want them to – fluids, dark room, anti-nausea meds and home in about 4 hours (at the most). By the time I leave I often feel worse for wear – and certainly more battle scarred – than I did when I first walked in there, doubled over and trying to not throw up on anyone. A much preferred view to a cubicle in A&E! There’s a type of low I have. It’s usually the middle of the night. I’m alerted to something not being quite right – this time, my iPhone beeped. This time I caught it before it became a complete white out hypo that I’ve no real memory of the next day. I switched into autopilot and started to do what I needed to do. I don’t know how it happens; it’s as though I am watching from above, telling myself what to do. Renza, there are no strips remaining in the canister. Renza, get out of bed and walk to the diabetes cabinet and get new box of strips. Renza, grab juice box from bedside table. Renza, stab straw into juice box and drink, drink, drink. Renza, cut slice of bread from sourdough loaf on kitchen counter. Renza, slather bread with Nutella. Renza, sit at kitchen table. I was methodical, my movements slow and deliberate, almost robotic, like Hymie from Get Smart. I could almost feel my brain actually engaging with each body part, telling me what to do: walk, reach, drink, eat, chew. I don’t know how long I sat at the kitchen table. I remember starting to focus on the pale light in the back garden and the shadowy figures the huge tree from over the back lane making. I heard Cherry the cat meow quietly at one point. Renza, go back to bed. Renza, use your arms to cover your body with the doona. I started shivering as I realized my hair and t-shirt were damp. I was tired, but couldn’t sleep. My overactive brain that had been busily directing my body, telling it what to do, wasn’t ready to shut down just yet. It was on high alert, and as often happens in that post-hypo murkiness, with the power to shut down the negativity completely deficient, all the scary thoughts started flying around. I thought about what could have happened; I thought about the times that the lows invaded everything and I couldn’t function at all, not remembering the spent juice boxes, empty wrappers, crumbs in the bed. The fear and darkness of hypoglycaemia threatened to overtake me and I knew that sleep that night would be lost forever unless I acted.